You want changes, but do not know what to do for this – downlad Ape Skin!? It’s time to start acting. So many new adventures await you in the image of this slightly wonderful creature. Who is this Ape? Judging by appearance, it’s a real monkey. 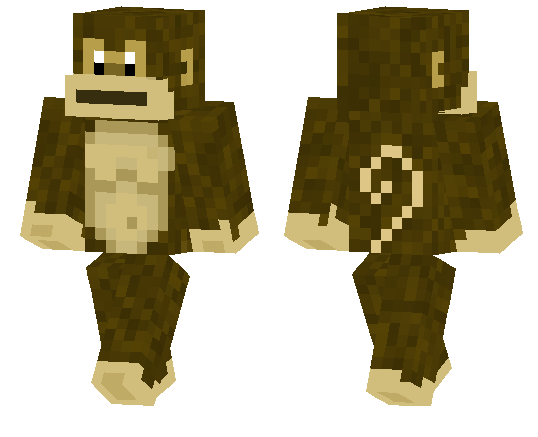 And yes, the skin Ape 1.1.5, 1.1.2 will give you the image of a funny monkey. You can bend, be a little kid and experience something new and unknown. What’s special about the Ape skin? From the moment you install it into your Minecraft PE game client of this skin, very much will change. But most of all changes should be expected on multi-user servers. Lately, many gamers have even forgotten that one of the proven ways to diversify their world is to change the image. One day you are a sweet and defenseless player, without the experience and survival skills, the second day – you are an evil boss trying to make your own rules and wishes. But it’s worth being ridiculous, in order to defuse an already tense stop. Therefore, if you feel that you really do not have enough, be sure to experiment. Skin Ape 1.1.5, 1.1.2 is the image of a funny monkey, which does not lose any opportunity to laugh, curl and be an amusing little creature. In her image, you will become so. Or vice versa – get angry at everyone and everyone individually. After all, adventures can be different. And not always they are within the power of gamers. Sometimes, something will go wrong and instantly begin various troubles and unnecessary fuss. There is always a choice in the MCPE. The new additions are a real confirmation of this.